See the following thread to review all AR dialogue. At 10:26 AM PST on June 11, 2007, a mysterious message appeared in the Halo 3 forum on Bungie.net with a subject line entitled, "System Integrity Confirmed." The thread was created by a user named AdjutantReflex, whose system security role is "CompoundIntelligence." In response to a post wondering if this was the work of a hacker, AdjutantReflex confirmed that it entered Bungie's systems "by force," but stated that it was irrelevant because there was no hostile intent. AdjutantReflex edited the first reply by another user, showing a system ability to edit other posts. After exactly 100 excited and confused replies from forumgoers, AdjutantReflex locked and stickied the thread, showing that it has other moderator powers as well. The thread was open for about two hours. AdjutantReflex then moved to Bungie.org, posting a similar series of mysterious writings in the halo.bungie.org forum. At exactly 11:00 AM PST, AdjutantReflex created another thread entitled "Archive/Resource Estimate," with its first post stating that "Archives/Resources will be compiled in approximately 38 hours [1:00 AM PST on Thursday, July 14]." Another several posts followed, but no further substantive information was gleaned. At 3:43 PST, AdjutantReflex posted an addendum to his locked thread entitiled "Archive/Resource Estimate" with the text "Tick Tock." In the hours counting down to the 1 AM PST deadline there were two other posts by AR. Shortly after 1 AM PST several members of B.net recieved emails from Xbox Flash with a cryptic poem inside. It was titled "Look for the signs, Keepers of the Flame". Forerunner glyphs were noticed, not only inside the email (above) but also on Master Cheif's visor at Halo3.com. The third glyph found is AdjutantReflex's new icon on Bungie.net. The fourth glyph found on the last page of halo3.com/comic. 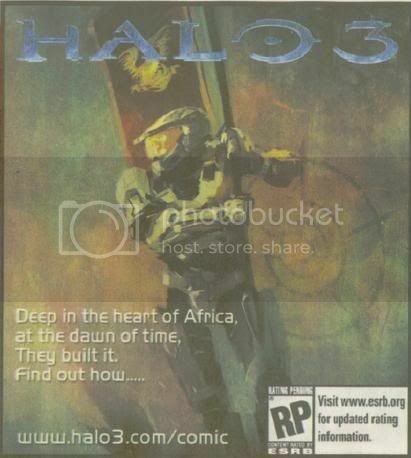 Found on a website connected to the IP address found in the Halo3.com comic strip. The last digit is a 3 instead of a 5. At 3:43 PM PST AdjutantReflex began another thread at Bungie.net entitled, "Who?" with one other post following before going back into hibernation. This posting corresponded to a change at Halo3.com where the main page had been turned into five darkened pictures labled Servers #1-5. All five servers were locked at this time. Another section of halo3.com was uncovered (http://halo3.com/comic/) with an intriguing comic. Intrepid searchers discovered that the last page of this comic could be manipulated to give an IP address. "206.16.223.65" (Apparently all IP addresses listed 206.16.223.0 through 206.16.223.225 belong to Microsoft corp.) This site contained a countdown to midnight on the 20th-21st of June. Shortly after, the IP was manipulated (206.16.223.63) to lead us to a site associated with the (presumably fictional) organization entitled Society of the Ancients, or SOTA. A few minutes after this discovery a myspace page was discovered with references to this organization. Not much is known about this page, or other myspace or facebook profiles at this time. Members of the SOTA organization were spotted in Times Square in New York City wearing yellow shirts and holding picket signs with the glyph (above) eblazoned on them. They were also handing out flyers. The 206.16.223.65 website's text beneath the countdown began to change. A record of these changes is at this link. SOTA members were spotted in Vancouver, Canada and London, England, and many other locations across the world, enough locations that I cannot put together a definitive list of all their appearences myself. Another new glyph seems to have been found in this image here. AdjutantReflex posted again at B.net, this time with a quote from Macbeth and telling us he is being attacked somehow. And once more stating he would only be able to deflect assault for 22 hours, giving us a deadline around 5 PM EST on June 18. AdjutantReflex posted on b.net again, telling that someone stronger than he was going to defeat him (the details were unclear as to whether this meant destroy or corrupt, or some other method), and that he would leave his legacy to one person. The countdown on the 206.16.223.65 website sped up, giving a new final time of Midnight on the June 19 to June 20 transition. Over the course of the day several PMs were sent to B.net user x Foman123 x. These messages (viewable in the AR dialogue thread linked above) reiterated AR's previous statement that he was being overrun by some force. AdjutantReflex was then replaced with some other machine or entity and it's avatar on the B.net forums changed once again. After AdjutantReflex has been overrun, his avatar has been changed. At around Midnight Eastern Time, the site 206.16.223.65 had an update. What it was is that people recieved a "key" instead of that countdown timer. They had to take that key up to http://www.unlock.msgamestudios.com and be one of the first 100 to help unlock "Server 5" (Of which we would see server 1 on http://www.halo3.com). Once unlocked, the "Server" starts to show up on 206.16.223.65 and you were able to download 4 things, and watch a video of which seems to be AR's final transmission before being completely compromised. In trying to solve this mystery, you should be aware that there is a copycat. The same day that the original AdjutantReflex posts were created, a regular forum user created an account named "AdjutantRefIex" with a "capital eye" instead of a "lower-case ell" in the word "Reflex." That user attempted to make more mysterious posts, although the style of writing was inferior and distinctly different from the original and real AdjutantReflex's. Forum Ninja "just another fan" banned the imposter. Shortly thereafter, another account was created on Bungie.net entitled "ReticentAxiom." This user began creating posts nearly identical to the fake AdjutantRefIex, pretending to be another AI. Once again, they are recognizable by lack of gold text and inferior writing style -- not to mention a distinctly different "style" and "feel" to the posts from the originals. The best advice follows: don't believe it if it's not in gold text. Some information borrowed from the CompoundIntelligence forum on B.net. Last edited by Sir Topham Hat on Fri Jun 15, 2007 3:56 pm, edited 10 times in total. I did realize this quite a while ago...I even took care of it. I just must have never gotten around to fixing it. You could either stream them from my site (the ARG backup one, which ironically was deleted so I'm in the process of reuploading), or use the new fixed links graciously provided by Wu.